Global Travel Media » Blog Archive » Domino’s Launches Phase II of New ‘Quality Fresh’ Menu! Domino’s Launches Phase II of New ‘Quality Fresh’ Menu! 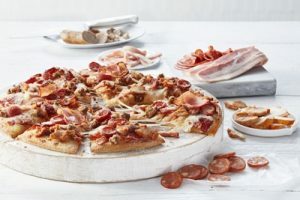 Domino’s has launched Phase II of its Quality Fresh Menu in all stores across Australia, which includes three new pizzas, one new side item, and a delicious new Thickshake flavour. The second phase of Quality Fresh includes the launch of a Salted Caramel Thickshake, Butter Chicken Pizza, Eight Meats Pizza, Garden Veg Pizza and BBQ Chicken Meatballs. With 20 new tasty pizzas and sides over 20 weeks, Quality Fresh gives customers more of what they want, with an increase in volume of toppings as well as more premium toppings on both new and improved pizzas. Domino’s ANZ CEO Nick Knight said the Company is excited to launch the new products to market. “We have listened to our customers and we have seen increased demand for these new products,” said Mr Knight. The Butter Chicken Pizza is one addition to the new menu, created by Domino’s Head Chef, Stefaan Codron, which combines succulent Seasoned Chicken with Jalapenos, Capsicum, Red Onion, Mushroom, Fresh Tomato, Spring Onion and Cheese on a Crème Fraîche sauce, topped with a delicious Butter Chicken sauce. “We are really excited about our new Butter Chicken Pizza. It’s a new and exciting way to present pizza and we can’t wait for our customers to give it a try. “We know that our customers love different foods and different combinations in their meals and we sought to create flavours that captured this. It’s something a little bit different and exciting on a pizza!” says Mr Knight. The newly introduced Eight Meat pizza combines Pepperoni, Beef, Seasoned Chicken, Ham, Italian Sausage, Pork and Fennel Sausage, Chorizo, Rasher bacon and Cheese on a BBQ Sauce, creating the perfect pizza for any meat-lover. However, if you’re after something with more vegetables, the new Garden Veg pizza has you covered, bringing together Spinach, Capsicum, Red Onion, Cherry Tomato, Cherry Peppers, Camembert and Cheese on a tasty Pizza Sauce base to make the perfect vege-feast! Domino’s also introduced BBQ Chicken Meatballs to the menu, topping tasty Chicken Meatballs with a Smoky Hickory BBQ Sauce. Domino’s has also introduced a new flavour of Thickshake alongside the existing Malted Vanilla and Chocolate Malt Thickshakes. 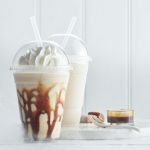 “We can’t wait for our customers to try our Handcrafted Salted Caramel Thickshake. They are available for home delivery, providing customers with a convenient, sweet treat delivered straight to their door!” said Mr Knight. “Domino’s is committed to finding the best products that customers will truly love and the new Thickshake and ice cream range is cooled to -14 degrees meaning our customers get a nice cold drink that stays cool during delivery. Thickshakes and the newly introduced sides provide Domino’s customers with more options and proves the brand is ‘More Than Just Pizza’. “We are so excited to revamp the menu with the launch of these tasty additions in Phase II of our ‘Quality Fresh’ range. Be sure to give the new products a try and let us know what you think!” says Mr Knight.